The Associate General Counsel for the National Labor Relations Board (“NLRB”) recently issued an Advice Memorandum finding that a franchisor was not liable as a “joint employer” for the alleged unfair labor practices of one if its franchisees. Applying the NLRB’s current standard of joint employment and the standard of joint employment proposed by the NLRB’s General Counsel in Browning-Ferris Industries, the Associate General Counsel concluded that franchisor Freshii Development, LLC (“Freshii”) was not a joint employer with its Chicago franchisee. This is welcome news for those in the franchise industry. Below, we discuss the Associate General Counsel’s decision, including the relevant facts and application of those facts to the two different standards of joint employment currently before the NLRB. In conclusion, we identify several “best practices” that franchisors should employ in light of this new Advice Memorandum. Focusing on the duties and obligations imposed upon Freshii by the franchise agreement and operations manual, the Associate General Counsel found that Freshii played “no role” in Nutritionality’s decisions regarding hiring, firing, disciplining or supervising employees. Further, the franchise agreement specifies that Freshii “neither dictates nor controls labor or employment matters for franchisees and their employees….” Any guidance provided by Freshii on these matters does not have to be followed by the franchisees. For example, the operations manual includes a sample hiring advertisement and sample interview questions to ask potential hires. It also explains how to calculate “labor cost percentage” based on the actual labor used and how to project labor calculations to schedule staff in advance. None of these employee hiring or management tools are mandatory and the franchisee is free to choose alternatives. Freshii also provides franchisees with a sample employee handbook that contains personnel policies, but again, does not require franchisees to use the handbook and policies. The Associate General Counsel found that although Nutritionality used the handbook provided by Freshii, other franchisees, including the stores owned by the nearby development agent, used a different handbook that contained different employment policies. The Associate General Counsel also found that Freshii was only nominally involved in employee hiring decisions. For instance, while applicants were able to submit their resumes through Freshii’s website for employment openings in the franchised businesses, there is no evidence that Freshii screened the resumes or did anything other than forward them on to the individual franchises. Lastly, the Associate General Counsel found no evidence that anyone other than Nutritionality is responsible for determining wages, raises, or benefits of its employees. Freshii’s requirements regarding food preparation, recipes, menu, uniforms, décor, store hours, and initial employee training were not evidence of control over Nutritionality’s labor relations but rather established Freshii’s legitimate interest in protecting the quality of its product and brand. For these reasons, the Associate General Counsel found that Freshii’s dealings with Nutritionality and/or its employees did not constitute a joint employment relationship under the current NLRB standard. In an amicus brief submitted by the NLRB’s General Counsel in the Browning-Ferris Industries, the General Counsel urged the NLRB to return to its traditional joint employer standard.9 Applying this proposed standard, the Associate General Counsel also found that Freshii was not a joint employer with Nutritionality. Under the proposed standard, a joint employer is found to exist where, under the totality of the circumstances, the putative joint employer wields sufficient influence over the working conditions of the other entity’s employees such that meaningful bargaining over conditions of employment could not occur in the absence of the putative employer. The General Counsel’s proposed standard makes no distinction between direct, indirect and potential control over working conditions and results in a joint employer finding where “industrial realities” make an entity essential for meaningful bargaining. Applying this proposed standard, the Associate General Counsel again found that Freshii did not significantly influence the working conditions of Nutritionality’s employees (i.e., “it has no involvement in hiring, firing, discipline, supervision, or setting wages”). Because Freshii does not directly or indirectly control or otherwise restrict the employees’ core terms and conditions of employment, meaningful collective bargaining between Nutritionality and any potential collective-bargaining representative of the employees could occur in Freshii’s absence. Thus, even under the proposed joint employer standard, the Associate General Counsel concluded that Freshii is not a joint employer with Nutritionality. What Do We Learn From Freshii? The conclusions reached in the Advice Memorandum are clearly a positive development for the franchise industry. The NLRB’s recent expansive view of joint employer liability has been viewed by many to seriously threaten the future of the franchise business model. If nothing else, Freshii represents a line in the sand on how far the NLRB is willing to push joint employer liability. Whether the Associate General Counsel’s opinions will carry the day is yet to be seen. As mentioned above, the Advice Memorandum does not have the effect of creating law; leaving the ultimate ruling of the NLRB still open for debate. For now, however, franchisors can (and should) make necessary changes to their franchise systems in light of the opinions in Freshii. For instance, franchisors should institute formal policies announcing their unwillingness to become involved in any unionizing activities of the franchisees’ employees. Franchisors would also be wise to focus their training, inspections and advice on business operations and brand standards – not employment matters. While guidance on human resource matters can still be made available via an employee handbook or other means, it must be abundantly clear that each franchisee has the option to adopt the franchisor’s personnel policies and handbook or to employ their own. Further, franchisors should never get involved in any issues or questions involving the hiring, firing, disciplining, supervising, or compensating of franchisees’ employees. Engaging in any of these topics will quickly set the groundwork for joint employer liability. And, of course, a franchisor serious about minimizing the risk of potential joint employer liability would be wise to seek the assistance of a seasoned franchise attorney. 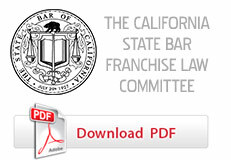 Amicus Brief of the General Counsel at p. 14, Browning-Ferris Industries of California d/b/a BFI Newby Island Recyclery, Case 32-RC-109684 (June 26, 2014)(“But notwithstanding the creation of an intermediary, franchisors typically dictate the terms of franchise agreements and ‘can exert significant control over the day-to-day operations of their Franchisees.’). The National Labor Relations Board is an independent federal agency – appointed by the President, with Senate consent – that acts as a quasi-judicial body in deciding cases involving the rights of private sector employees. Region 13 also asked the Office of the General Counsel to provide advice on whether Freshii’s Chicago development agent was a joint employer with Nutritionality. In footnote 3 of the Advice Memorandum, the Associate General Counsel summarily found that because the development agent’s activities fell strictly within its agreement with Freshii, the development agent was not a joint employer with Nutritionality. In light of this finding, the analysis provided in the Advice Memorandum only addressed the joint employment issue with respect to Freshii and Nutritionality. It was the Browning-Ferris Industries standard that was later applied in the McDonald’s case. CNN America, Inc., 361 NLRB No. 47, slip op. at 3 (Sept. 15, 2014). CNN, 361 NLRB No. 47, slip op. at 3 n.7 & 7. See Amicus Brief of the General Counsel at 2, 16-17, Browning-Ferris Industries of California d/b/a BFI Newby Island Recyclery, Case 32-RC-109684 (June 26, 2014).